We’d love your help. Let us know what’s wrong with this preview of Adudan by Dario Giardi. "Only when you no longer fear death will you be able to write your own destiny"
Marcel lives on a small island off the coast of Brittany. He dreams of becoming a famous writer but in his dreams he discovers his destiny and his true identity. A dream journey that takes him to the magical world of Atlas. There he finds out that he was Railen, the elite guard of princess Adudan "Only when you no longer fear death will you be able to write your own destiny"
A dream journey that takes him to the magical world of Atlas. There he finds out that he was Railen, the elite guard of princess Adudan. For Marcel those visions are the first piece of a story whose roots go back to the dawn of time. Memory by memory, he begins to piece together his past, narrating to us the events that forced him to part with his beloved Adudan. Dogged and constantly threatened by the Draconians, a cruel alien civilisation, the two lovers must separate in order to protect the Crystal of Atlas. To ask other readers questions about Adudan, please sign up. now more to come for this review when i finish reading this book . Sul regno di Atlas incombe il nemico, il Neoimpero di Draconia. Per impedire al terribile imperatore Seth di impossessarsi del cristallo, e quindi apprendere tutte le conoscenze celate in esso e dominarne il potere, Railen e Adudan, sotto consiglio del Sacro Albero devono separarsi, andare sul pianeta Gaia e creare due comunità distinte e separate, Lemuria e Atlantide. Il tempo passa inesorabile sulle loro vite con la costante paura che prima o poi Seth li possa ritrovare. L'imperatore di Dracon Sul regno di Atlas incombe il nemico, il Neoimpero di Draconia. Il tempo passa inesorabile sulle loro vite con la costante paura che prima o poi Seth li possa ritrovare. L'imperatore di Draconia ha ormai trovato e raggiunto Atlantide, e Railen deve trovare il modo di attraversare lo spazio temporale per sfuggirgli o almeno ritardare il suo attacco. I was given this book to review almost a month ago and I finally had the chance to finish it! 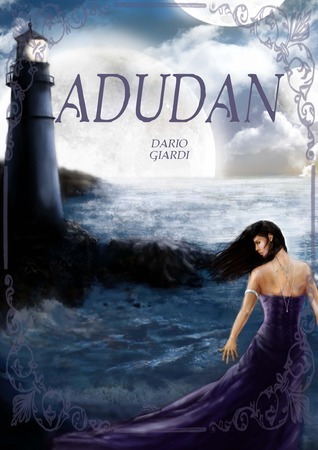 Adudan is an urban-fantasy romance debut novel by Dario Giardi. It is about two people who are in love, Railen and his princess Adudan. They were forced to separate but then find their way back to each other. The way the book was written was excellent, it made it an easy read. The details were great, everything was straight to the point, but the only things I really craved for is the details when it cam I was given this book to review almost a month ago and I finally had the chance to finish it! The way the book was written was excellent, it made it an easy read. The details were great, everything was straight to the point, but the only things I really craved for is the details when it came to the fight scenes. I thought that needed a little bit more detail because I felt like something was missing or it wasn't enough. The book cover really speaks on what's inside the book but doesn't really reveal all it's content. It's a good cover but I don't think it will be the reason why I would pick this up from the shelves. In conclusion to this review, I really enjoyed Adudan, I loved the way it began, I loved the way it ended. It was an engrossing and easy read. And I recommend this book to those who love reading about forbidden romance or romance in general and those who enjoy reading about fantasy. A fantasy/romance, this book has vivid details of the magical world of Atlas and a passionate romance between Railen and the woman he protects- Princess Adudan. It was different from the books I usually read but I found I got caught up in their world. This book wasn't really my type of book. While the writing was ok, I couldn't get engaged in the story. One of the few and far between books that I could not finish. It was just too vague and tried to encompass too many theories about the universe in a disorganized way. I was dissappointed.